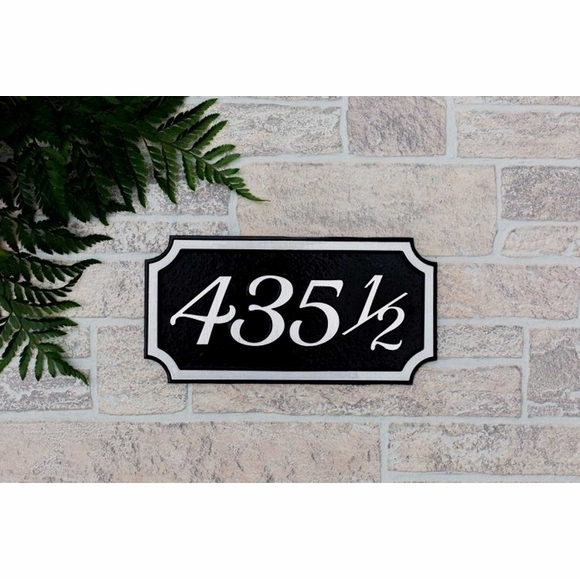 Chamford House Number Plaque - - recommended for coastal regions where salt is a challenge. Rectangular-shape plaque with concave corners. Made in USA. Solid cast construction with powder coat finish. Finished with a UV-stable polyester powder coat that is designed to withstand the harshest weather elements. Will not fade, chip, or peel like the less robust painted plaques currently on the market. Note: Powder coating was designed and developed to out-perform paint, especially in the coastal regions where salt has proven to be the number one enemy. With three font options and four color options a Chamford plaque is not only functional but allows you to express your personal taste and make a lifestyle statement at an affordable price. Font options: traditional (AT), modern (AM), designer (AD). Color options: black (5), bronze (15), silver vein (9), copper vein (11). Large image shown in black with designer font. Includes matching powder coated installation hardware. Dimensions: 11 5/8"W x 5 7/8"H; weighs 2 1/2 pounds. Chamford House Number Plaque recommended for coastal regions. Solid cast construction with powder coat finish. Made in USA.